In the wake of a brewing storm around an essay from Paul Graham about immigration (of all things), I got thinking about the last three months at work. Working remotely is extremely flexible. This has been unbelievably good for me. If I need to take our little guy to the doctor one morning, I just tell my team when I’ll be back and fit those hours in later in the day. No problem. I can also go for a run or work out whenever I want. I can put supper on in the afternoon before my wife gets home from work. It’s a huge plus. Working at night “counts” now. For as long as I’ve been computer-ing, I’ve been working at night. Client projects, personal projects, redesigning this site, learning something new, etc. My wife is a teacher, and spends time most nights preparing for the next day, so we both generally do at least some work every weeknight. Now that I work remotely, I can fit in 2, 3 or 4 hours in a night to catch up on hours that I’ve missed for whatever reason throughout the week. It’s fantastic. This time I work in the evenings “counts” now, adding to the overall flexibility benefit. In the past three months, I’ve worked on some crazy projects, for some huge clients. I’ve been exposed to tools I’ve never heard of, and (quickly) sharpened my skills in the tools I’d been using all along. I thought I knew Git before starting at 10up, for example, but I really, really didn’t! Within two weeks, I’d made a thousand mistakes and really fixed and solidified my workflow. The range of people I work with is incredible. Almost every day, someone will try and convert me to their favourite tool or way of doing something. Having access to so many knowledgable and experienced people keeps you constantly curious and on your toes. Communication is lightyears ahead of (the) standard offices (I’ve worked in). When you work with people all over the globe, you just need good communication tools. At 10up, we use the best tool for every job. People are constantly evaluating new tools for meetings, calls, screensharing, group chat, etc. The combination of all these tools allows me to collaborate much more efficiently with my co-workers than I ever have in a standard office. There are very, very few emails, and 99% of communication happens in real-time via HipChat or a face-to-face Google Hangout. 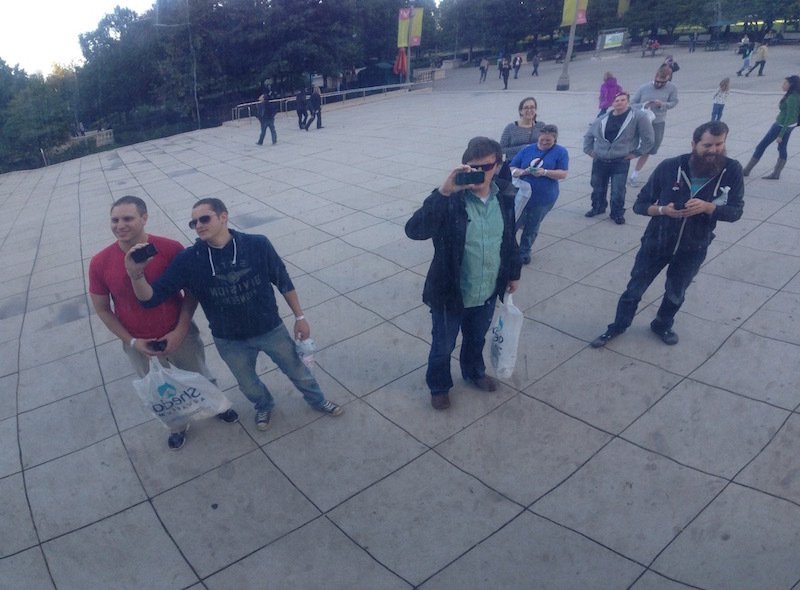 Team meetup in Chicago, Oct. 2014. Also definitely in the “pro” category. So those are all the pros, but what about the downsides? Honestly, if you’ve been reading along, waiting for the bit about being isolated from co-workers and longing for “real” interactions that you have in normal offices, I don’t have it. At least not yet. I feel extremely connected to the people I work with — and generally to the outside world as well. Granted, it’s only been three months, and I may feel very different in a year’s time, but so far it’s really been great. If I had to list one downside — or more of a difficulty really — it would be dealing with timezones. In Newfoundland, we get the first sunrise in North America, so I’m often up hours before my west coast co-workers. It can be a bit of a challenge when I need to ask them a question, but have to wait till lunchtime for an answer, but it works both ways. If I want get up and go for a run, and start my day at 10:30am that works perfectly. Doing this in a regular office setting is almost impossible — unless you want to get up at 5am. So that’s how remote work feels, three months in — just great. If you’re getting discontent at your current office situation, you should have a look around for remote opportunities. Honestly, the idea of working remotely seemed absurd to me just a year ago (actually, it still kinda does). I thought it was only for people in San Fransisco or Portland. But really, it’s a very legitimate option these days for certain careers. If you’re actively searching, CSS-Tricks has a new job board, and WeWorkRemotely is a more established board. Have a look. Of course, if you’re into WordPress, you should definitely have a look at 10up!